The manufacture of fake medicines is a billion-dollar business that is covered up and maintained by corrupt authorities and governments, Dr. Bakhtyar Baram stated at the March 5, 2019, meeting at the UPF Peace Center. The meeting was attended by 25 people, among them several chief physicians, other doctors, nurses, a Christian pastor and missionary. Many of the guests were family, friends and contacts of the speaker’s. 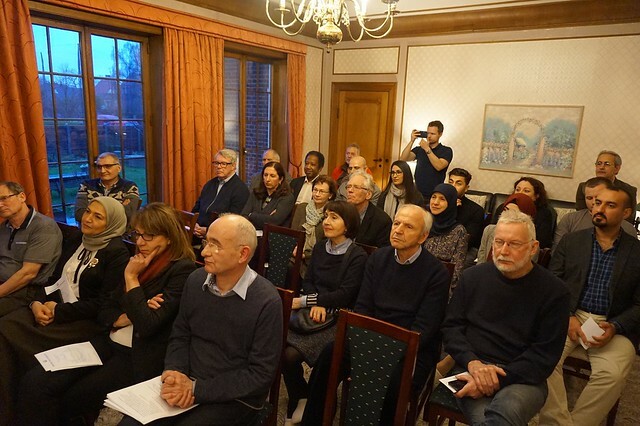 Thorkil Christensen, the co-chair of UPF-Denmark, started the program by welcoming the guests and giving an introduction to UPF, its mission and peace principles, and its work to create world peace as one family under God. Then the video “What Is an Ambassador for Peace?” was shown. In 2017 Dr. Baram was appointed a UPF Ambassador for Peace based on his volunteer work in Iraq. Dr. Baram began his presentation by expressing his pride to be an Ambassador for Peace and a member of UPF. He came to Denmark from the Kurdish region of northern Iraq and worked as an orthopedic surgeon both in Iraq and Denmark. He also has done humanitarian work in Palestine. His wife also works as a chief physician in Denmark. For the last few months Dr. Baram was working in Iraq. At the beginning of this year, however, he no longer could keep silent about the suffering of his patients due to fake and substandard drugs. In an attempt to bring some attention to this grievous problem, he went on Iraqi television and publicly called on the relevant national authorities to address this problem. What he never expected was that, later that same night, gang members would make an attempt on his life because of his honest statements. Though shocked by the incident, he luckily survived the vicious attack but had subsequently no other choice than to flee the country immediately, fearing for his life. With sarcasm he mentioned, “In my area, some say only 70 percent of the medicine is fake or substandard.” Several trucks filled with substandard medicine cross the border to Kurdistan every day. Such medicine injures and kills thousands of people—many more people than ISIS does, Dr. Baram said. This obviously has many unfortunate consequences for the mainly poor and disadvantaged people, he said. Their health is seriously compromised; in addition to their original illnesses, they risk serious complications from taking fake and substandard drugs. It is not only the patients who are affected by this huge problem. The good name and timely efforts of the scientists and medical corporations working hard to develop proper medications are negated—not to speak of the great frustrations that many doctors, striving daily to improve the health of their patients, suffer when their patients’ health deteriorates further despite the doctors’ best efforts. Therefore, Dr. Baram took the initiative to establish the International Organization for the Eradication of Fake and Substandard Medications (www.ioefm.org). The audience was shocked by the scale and size of this problem. During the question-and-answer session, participants tried to come up with proposals and steps to focus attention on and solve this terrible problem. At the same time, the issue put our domestic problems into perspective. The audience expressed great respect for the work of UPF. Many participants thanked the UPF staff for taking up and focusing attention on this serious problem. After the program the guests enjoyed a delicious dinner that Dr. Baram ordered from a Kurdish restaurant. The guests took part in lively discussions and networking during the dinner and coffee time.